f.a.m.p.s. works with a live internet connection on your PC or Mac. 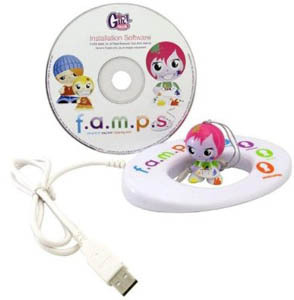 Famps games, emoticons, and screensavers give your desktop a total makeover. Each figure unlocks its own application. Spruce up your desktop, e-mail and IM to express yourself in all kinds of fun new ways with your friends and family. Let your emotions run free with custom wallpapers, e-cards, and avatars.